If we truly live we will experience failure. 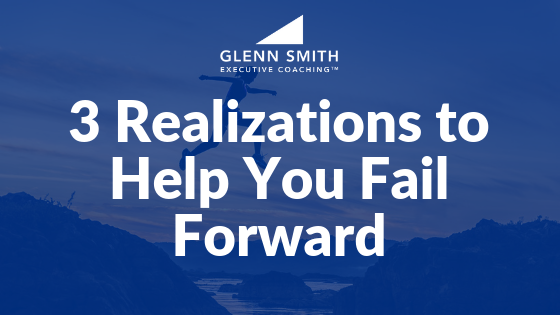 But here are 3 realizations that will enable you to fail forward. First, realize that failure has no meaning until I ascribe meaning to it. Second, realize that the distance between failure and success is called PERSEVERANCE. There are many inspiring stories of men and women who persevered in trying situations when many others would have quit. But because of their perseverance these people experienced great success due to their perseverance. One of my favorite stories is about R. H. Macy, the founder of Macy’s Department Store. Macy started working at the age of 15 on a whaling ship traveling around the world. After four years on the ship he worked several odd jobs and then took a position as an apprentice in a printing shop. However he had much greater ambition than that so six months later he struck out on his own opening a small thread and needle store in Boston. Though he worked hard, the business failed within a year. The next year Macy opened a dry goods store. Again he worked hard but again he failed. The following year he decided to go into business with his brother-in-law, but that didn’t go well so he soon moved on. After that R. H. Macy and his brother Charles decided to head west and try their hand at mining during the California gold rush. They failed to strike it rich but they discovered that there was an opportunity to make money selling goods to the miners. It finally seemed like things were beginning to work in Macy’s favor – until the gold ran out and the miners left the area. So that came to a disappointing end and Macy headed back east. His next venture was another dry goods store in Massachusetts. Though by this time he had learned quite a bit about business and advertising, this business failed too. He quickly tried again with a different strategy, a “low price” strategy. But after three years of struggle Macy had to sell out and declare bankruptcy. At that point Macy decided to get out of retail and become a stockbroker and then a real estate broker. But that didn’t go well either. He had tried five different professions by the time he was 35 years old including six failed attempts in retail. Nothing had really worked for him. Then he decided to try retail one more time in a different location, Manhattan. Because of his great perseverance, Macy finally had real success. We must realize that success is typically found at the end of a long road called perseverance! It is only through failures that we learn some of the most important lessons of life. While it is never fun, failure can serve us well if we allow it to. J M. Barrie once said, “We are all failures – at least, all the best of us are.” Failure can make us much better people if we learn to fail forward. I hope you will embrace these 3 realizations. As a business and executive coach, it is my aim to help professionals become better business leaders and better people. Contact us for more information and to schedule a no-obligation consultation to grow into a better business leader. Helen Keller said "Life is either a daring adventure, or nothing." We must not allow the fear of failure to hold us back. 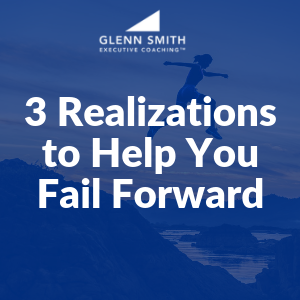 Here are 3 realizations that will help.